On a date with my husband and together, we decided to taste biryani for the first time. We stepped in Delhi Darbar, Colaba, Mumbai, and glad we made the right choice. Enjoyed mutton biryani, an aromatic dish with the meat pieces delicately spiced, tender and melted-in-the-mouth. 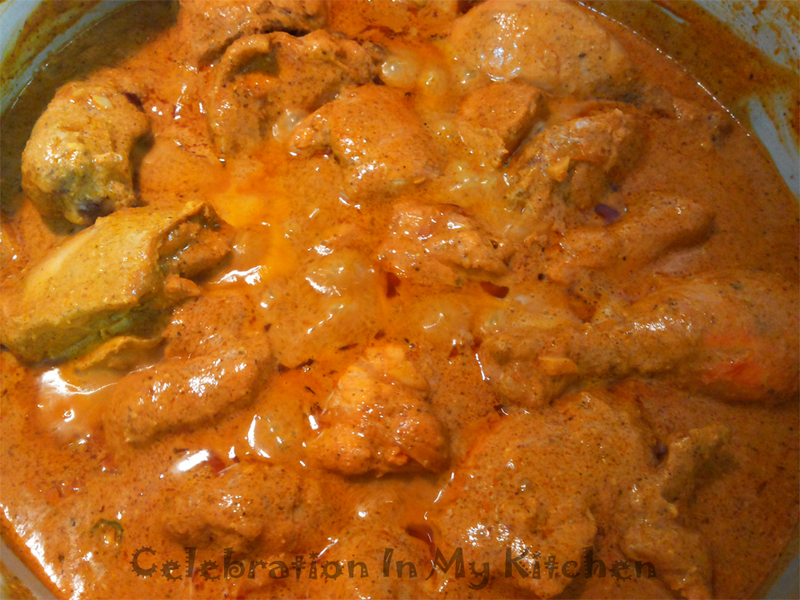 They were combined with the long, fragrant basmati rice laced with clarified butter and saffron. From then on, biryani was one of our favourite dish. Over the years, I tried to challenge and master the art of making this spiced rice dish at home. 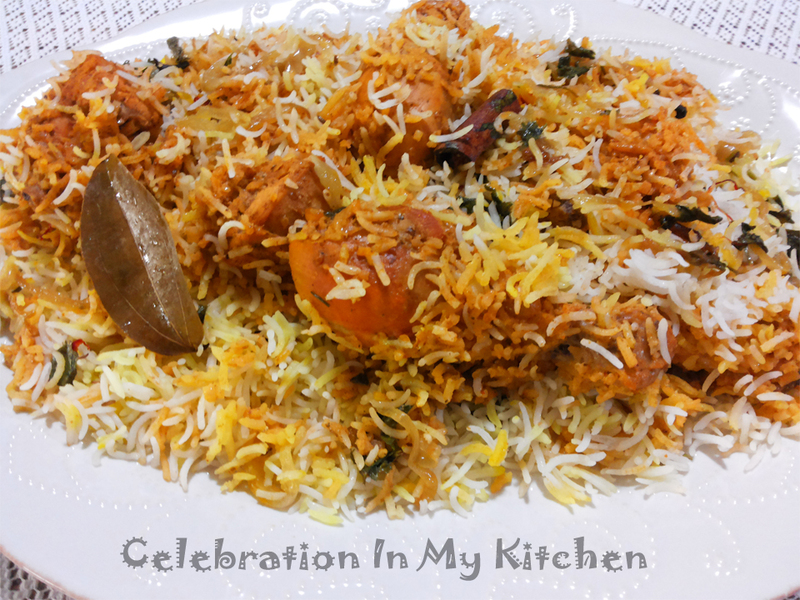 This is a variation from the regular mutton or chicken biryani. The popular chicken tikka is combined with rice to create the ultimate biryani. Chicken pieces are marinated with spices, yogurt and lemon juice for a couple of hours. Cooked in butter with caramelized onions, ginger, garlic, tomato paste until done with enough creamy gravy to dress the fragrant basmati rice. An irresistible and delectable rice dish served with raita and papad. Perfecting biryani comes with practiced technique. Choose the best quality of basmati rice. After washing the rice, soak for 30 minutes. 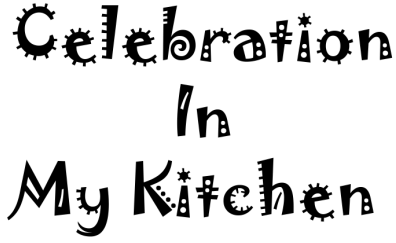 When cooking the rice, add a good amount of salt and a dash of vinegar to the water. This gives the grains a firmer texture and a whiter hue. Marinating the chicken or meat overnight or for several hours is key. This process tenderizes and flavours the meat. Cook the meat until done in a thick wide bottomed pan for even distribution of heat. Once the rice is spread on top of the meat, cook on dum using the lowest possible setting with the lid of the pan tightly sealed to trap in all the heat and aroma. After 15 to 20 minutes of slow cooking, dish out a fragrant royal classic. Wash chicken pieces, drain water, season with salt and the listed ingredients under marinade. Cover bowl and leave to marinate in the refrigerator, preferably overnight. Heat 3 tablespoons oil in the skillet and brown the sliced onions. Set aside. In a deep wide thick bottomed pan, melt butter, add half of the brown onions, garlic and ginger. Cook for a couple of minutes and then add the tomato paste. Stir in the marinated chicken along with all the marinade. Use the one cup water (listed in ingredients) to loosen any marinade stuck to the bowl and add to the pan along with the green chillies. Cover and cook on medium heat stirring occasionally till chicken is nearly done and gravy thickens. Check for seasoning and add salt. Before you start cooking the chicken, soak rice in water for 30 minutes. When chicken is half cooked, boil water in a separate pot for rice. When water starts to boil, add the rice along with the spices listed above, vinegar and salt. Cook the rice till half done (50%). Drain out the water. Spread the entire rice over the cooked chicken. Do not worry if there is some gravy. The rice will absorb all the moisture. 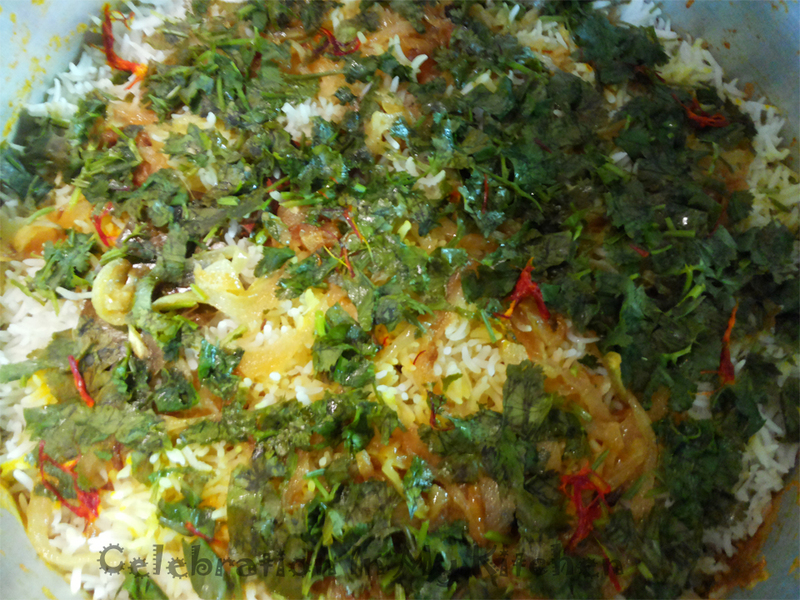 Sprinkle reserved brown onions over the rice along with mint and coriander leaves. Pour the saffron milk at different spots over the rice along with melted ghee. Cover pan and cook on very low heat (dum) for 20 minutes. Shut off flame after the indicated time. The rice will be perfectly cooked. Stir rice to mix with chicken. 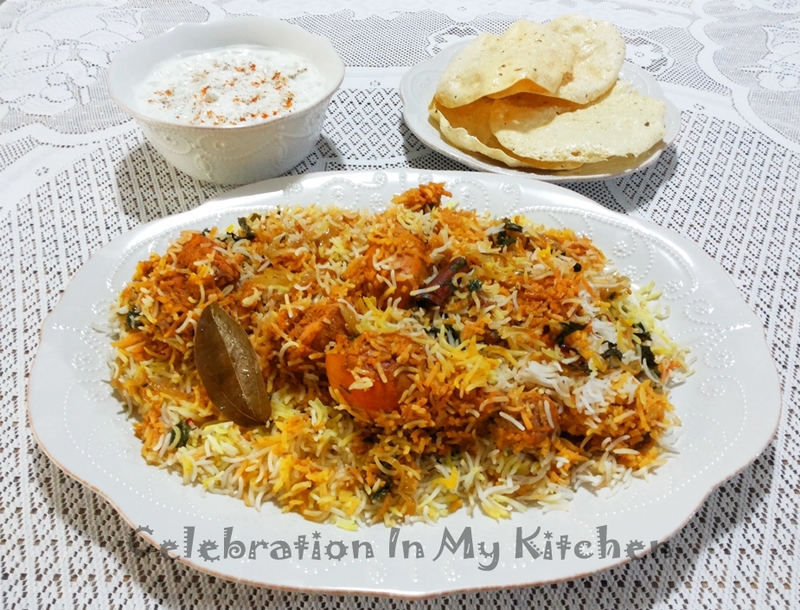 Serve warm biryani with papad and raita. Indian Gate Basmati Feast Rozzana rice was used for this biryani.